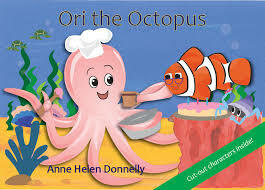 Ori the Octopus is fun picture book written for preschool aged children. The text is simple and the illustrations are bright and bold with cartoon-like characters. The first page invites children to join in the actions of Ori and his friends during the story, and sets the tone for a playful reading experience. Ori is a friendly octopus who likes helping his sea creature friends. When it’s Sally Starfish’s birthday he decides to make a cake for her. ‘Mix, mix, mix the cake.’ What starts off as a simple act of kindness slowly becomes a difficult task as his friends drop in, one by one, to ask for Ori’s help or attention. He does his best but soon realises that, even with eight legs, unfortunately he can’t assist everyone. Eventually things go wrong, and the tasks get muddled up. Fortunately for Ori, none of his friends like to see him tangled so they all pitch in and work together to get everything done. Then, at last, they can celebrate Sally’s birthday! At the end of the story there are notes for teachers and parents, offering discussion points for a young audience. Following this are three pages of Ori the Octopus puppets to cut out. These puppets are a great inclusion, as re-enacting the story is excellent for young children’s language development and to consolidate their understanding of the book. If children are still keen after their puppet show, there are many more activities to download from the author’s website (annehelendonnelly.com) including dot-to-dots, mazes, spot the difference, matching and counting activities. This 40-page paperback offers themes of friendship, kindness and teamwork. This book is suitable for children aged 2 to 5 years.